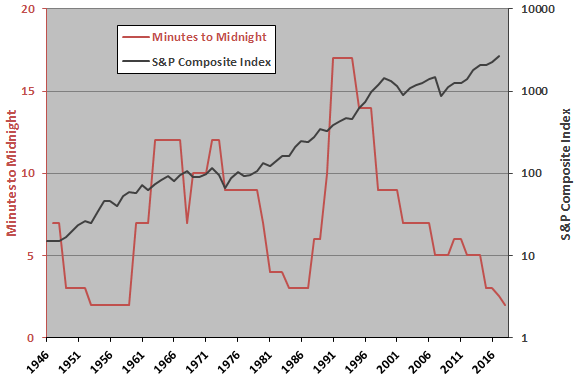 The following chart tracks “Minutes-to-Midnight” and the S&P Composite Index over the available sample period. There is no visually obvious relationship between the two series. Average annual “Minutes to Midnight” is about 7.3 minutes, and the series does not clearly trend upward or downward (may have a stable mean). 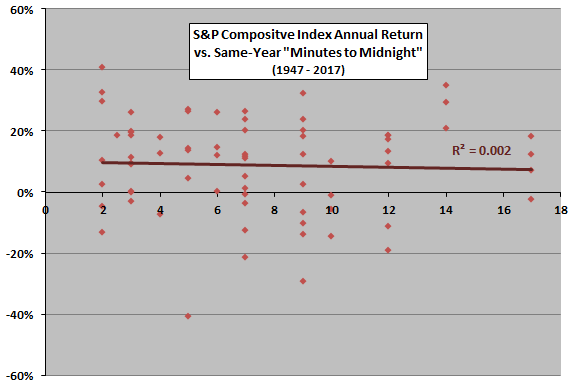 For precision, we relate annual “Minutes to Midnight” to annual S&P Composite Index return. Changes in “Minutes to Midnight” occur near the beginning of years. For example, the 2.5-minute proximity to doom for 2017 relates to the 2017 S&P Composite Index return of 18.6%. When there is no change for a given year, “Minutes to Midnight” is that same as the most recently issued judgment. For example, the proximity to doom for 2013 and 2014 is the same as that for 2012. The Pearson correlation between these two series is -0.04 and the R-squared statistic 0.002, indicating practically no relationship between proximity to doom and annual U.S. stock index return. Might there be a lag between proximity to doom and stock market return? 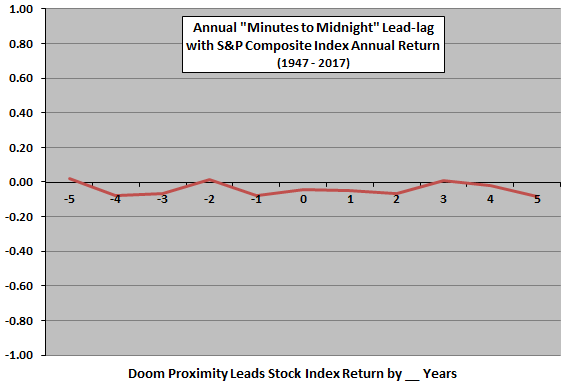 The next chart summarizes annual correlations between annual “Minutes to Midnight” and annual S&P Composite Index returns for lead-lag relationships ranging from S&P Composite Index return leads proximity to doom by five years (-5) to proximity to doom leads S&P Composite Index return by five years (5). All correlations are very small, indicating noise rather than leading or lagging relationships. In summary, evidence from simple tests on limited data does not support belief that proximity to doom as judged by the Bulletin of the Atomic Scientists has any connection to past or future stock market returns. The number of judgments for proximity to doom is small in the context of stock market return variability, so confidence in findings is modest. The Bulletin of Atomic Scientists may not be representative of investors (or even of atomic scientists) regarding outlook for doom. The “Minutes to Midnight” metric may be too vague for investors to interpret. The monthly S&P Composite Index uses average daily levels during a month rather than end-of-month levels. This blurring may not be material for annual returns. The doom concept does, however, have its uses.